The "Craps Pit!" This is where it all starts! No standing around a Craps table in a casino and listening to a casino employee attempt to explain the game of Craps. From the casino's viewpoint! Yeah! Right! No sitting in a classroom listening to theories and systems that are "proven" to work! In the Craps Pit you get hands-on instruction and learn how to play the game RIGHT, from the pro himself, the Dice Coach! The photo to the right is the actual table that you will use for your personalized class. It was purchased locally from a casino, and as you can see, it is in beautiful condition! This is our classroom! Small personalized classes and a maximum of 6 students ensure that you will get your questions answered in a relaxed and comfortable atmosphere. All three classes, The Basics, Dice Setting and One-On-One (individual personal instruction) use the Craps Pit. In the Craps Pit you'll use real casino-type chips and learn where to place your bets, and where your money moves when you place a Come bet or make a Place bet. If you're taking The Basics class, you will learn the difference between a Come bet and a Place bet, and which is the best bet for a beginner. In the Dice Setting class you'll learn about regression betting, when to use it and how. The Dice Setting class will also teach you how to identify your own signature numbers and use that to your advantage. We use regulation casino dice in the Craps Pit. The dice we purchase come from the same companies that the Las Vegas casinos use. 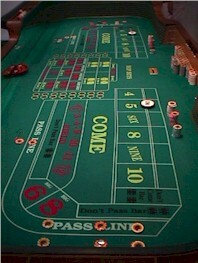 A real casino Craps table, real chips and real casino dice! It's a great opportunity to learn casino Craps and dice setting the right way! Add to that the Dice Coach and his assistant coaches, and you have a winning combination! "I recommend you to take some lessons offered at DiceCoach.com if you are going to Vegas. Online craps differs a lot from live craps and the live courses really impressed me. A big thanks and my best recommendations goes to The Dice Coach! I had a great time on my first trip!" Be sure to read the testimonials from other Craps players that the Dice Coach has worked with, as well as his own story under the coach. Here's an individual that has a passion for gambling and a love for people. What an unbeatable combination! When he's not in the Craps Pit teaching others what he knows, he's in the casino practicing what he preaches. Like any master, he is constantly working to improve his own skills, techniques and tactics. Meet the Dice Coach in an upcoming class. Sign up now while space is still available! 100% Money-back guarantee if not fully satisfied. The casino is crowded; you want to play but the tables are full. You've just spotted a guy ready to leave a table because he just lost all of his money. But why would you want to take his place?